I made a commitment at the beginning of the year, whenever possible, to be find happiness in being a London Home Tourist. I moved to London for a new adventure and personal challenge in April 2013, and have never looked back ever since. Every day I discover something new and my work challenges me daily. Greenwich is a great place to visit with the market, architecture, its craft stalls, street food vendors which were very busy and the shops around the market. 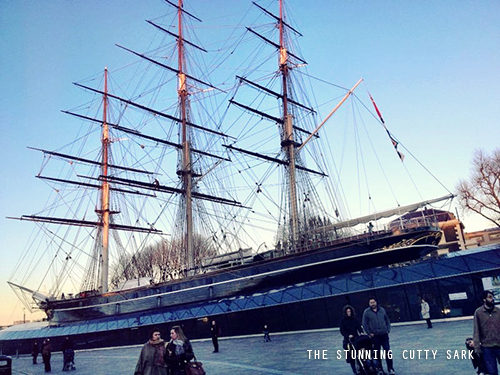 It was also great to see Cutty Sark, the last time I saw this was when the ship was still covered and being restored after it’s fire in 2007. If you have a love of British History and all things naval you will particularly enjoy a visit over this side of London. I made time for a quick tea and cake stop at Biscuit Ceramic Cafe. 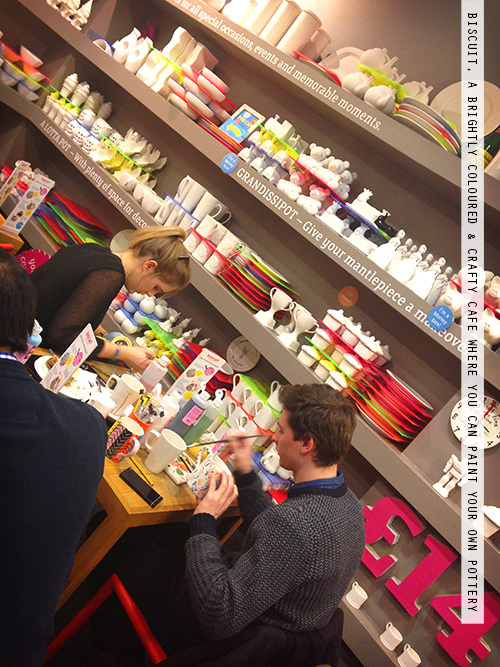 Biscuit is a brightly coloured & crafty cafe where you can paint your own pottery including cups, bowls, plates and other gift-like objects, or simply enjoy a hot drink and a slice of home-made cake (I did). While some people say this area (Greenwich/Cutty sark) is touristy, I found it to be quaint and idyllic, a great spot for being leisurely and getting a bite or treat to eat. I enjoyed the walk around Greenwich Market and ended my visit by stopping off at a nearby local pie shop for a ‘pick me up’ meal – it would’ve been rude not to! Goddard’s at Greenwich Pie Shop sells traditional wholesome meal basics, a family run business serving pie and mash since 1890. The staff were super friendly, and arriving 30mins before closing, the restaurant was still busy and customers were still coming in, always a sign that it’s good. I must stress Goddard’s is not fine dinning its good honest East End nosh, pure and simple which brought back vivid memories of my childhood in the parent’s Chinese Takeaway when mum bought pies from the local butcher we’d by our meats from for the shop. Next time, I’d like to travel to Greenwich by boat from Westminster pier which I’ve been told is great and you can see so much more from the river. I want to hear from you. What’s the best hidden gem in your home town no tourist would find? Share your thoughts in the comments section below. Sometimes it’s fun to be a tourist in your home town… try it, and discover something new right on your doorstep!